THE FLEUR AND FLOUR HAS GONE PUBLIC! I participated in my first market over the weekend. 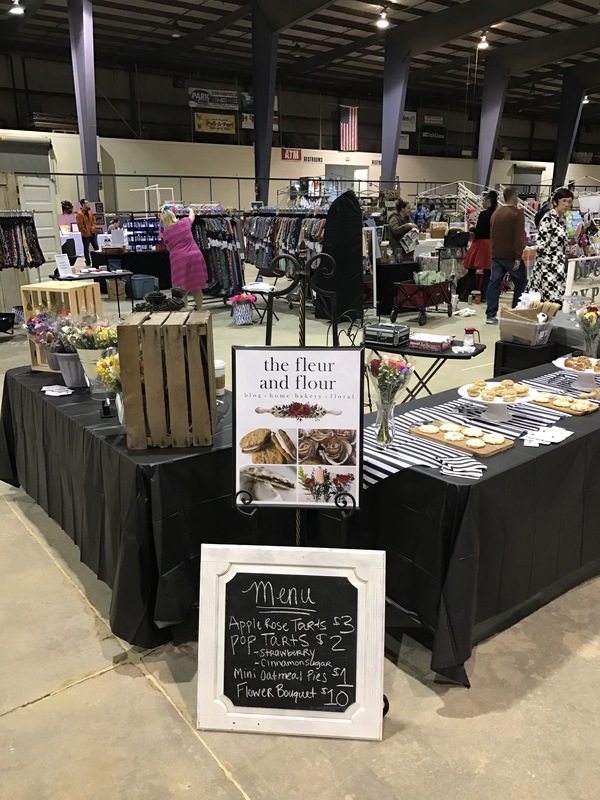 Ohio Makers Market was a first time show held on Saturday, May 6th at the Summit County Fair Grounds. I have been baking out of my home since November 2016 so I am still very new to my recipes and brand. Going public scared me, but I knew I had to try or I would regret it! I signed up for OMM and started planning the menu, the brand and an image. I have an odd obsession with black and white stripes, so I knew I wanted to incorporate this somehow. I also wanted to remain true to my name – fleur and flour = fresh flowers and baked goods. Since I fell in love with Paris (and fleur means flower in French) I wanted to stick with this image. I used black and white stripes as a branding opportunity to make an impression. 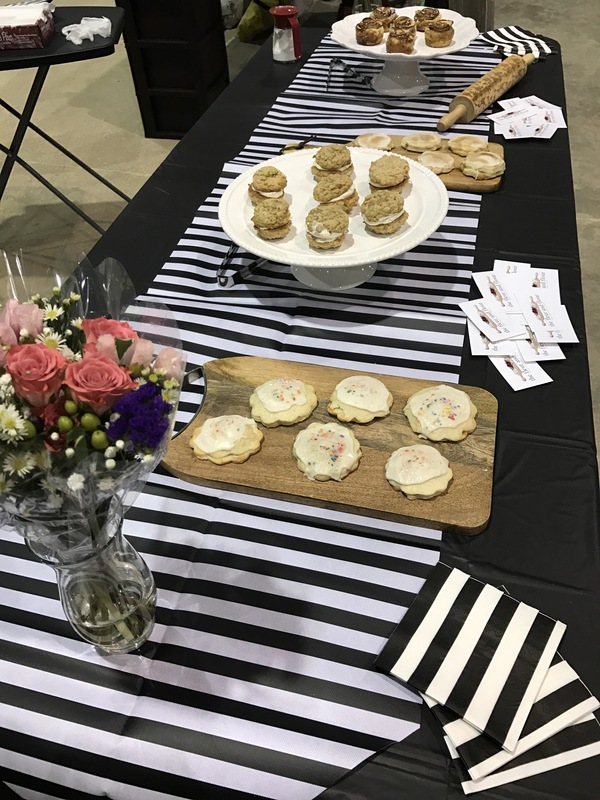 I purchased a 10×10 tent with a B&W striped canopy and followed suit with tissue paper for the flowers, table runner, napkins and small treat bags. My hope was if someone saw someone else eating or carrying flowers with B&W striped wrapping, they would look up and see the B&W striped tent and gravitate that way. I used apple crates for décor and also white cake plates / wooden cutting boards to display the baked goods. The menu was written on a chalkboard. To say I was stressed and nervous is an understatement. I was very excited to see how the public would react to my product, but I am always scared of failure. Since this was my first market and the first time this particular market was taking place, I had zero history. I made a grid in Excel and priced everything out. I knew I at least wanted to break even after all the upfront spending I had to do. I also knew I wanted to sell out of my baked goods. My sister and I baked for NINE HOURS the day before the show – I had several self-doubt moments, but my sister and husband kept me going. Thank god for family! On Saturday morning, we packed the cars and headed over to the Arena. The weather was against us (raining and 48*) so the market organizers worked out to have the entire event indoors. They were amazing to work with because I’m not sure if I would have stood outside for 8 hours in the cold and rain – nor would our attendees! 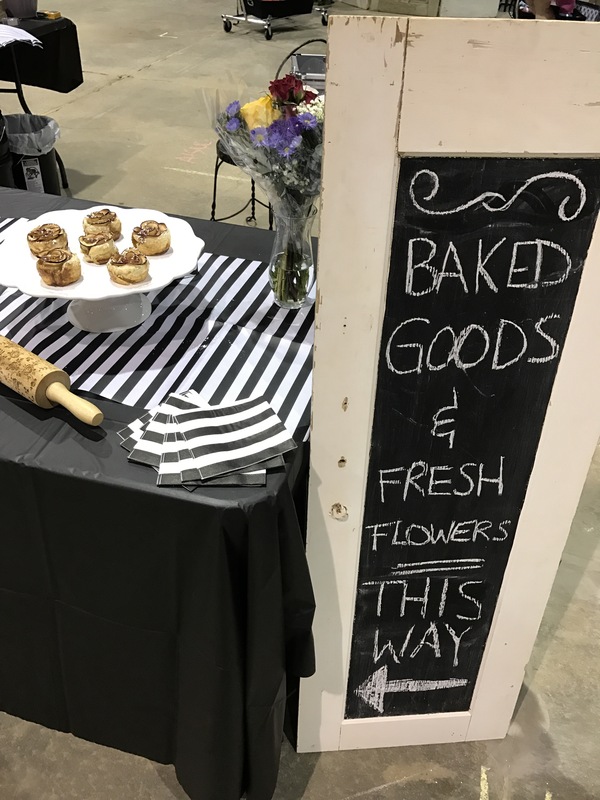 We set up our booth with FLEUR (flowers) on one side as a flower bar and FLOUR with the baked goods displayed on the other. We were ready! 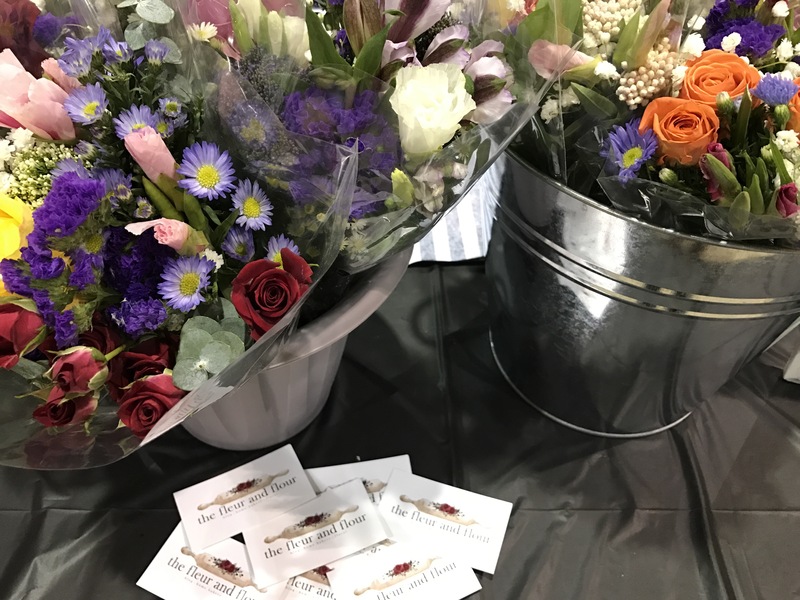 We sold out of our baked goods in the first 3.5 hours and sold all but three flower bouquets! After the first couple attendees tasted our baked good and gave positive comments, I knew it was going to be a good day. People loved the menu, the look of the booth and the concept. To my surprise, I was invited to 7 more markets/festivals – 4 while at the show and 3 more via email the next following days! As I have said before, I am all about creating experiences and this time it was for others AND me. I hope to appear at a couple more shows/markets/festivals this Summer and Fall. Who knows what will become of The Fleur and Flour, but I am excited to see what the future holds! Thank you for all of your support this far! I hope to see some of you locally. Check back on my social media (facebook & instagram) for more information on where I will be next.